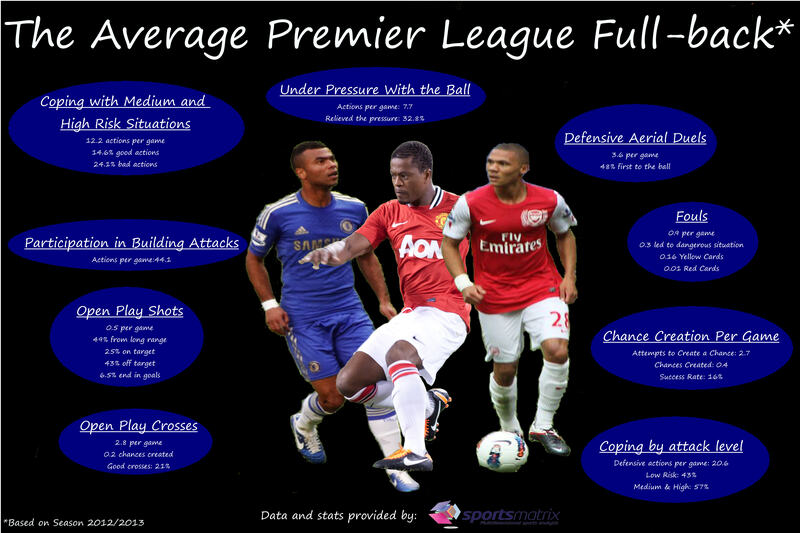 sportsmatrix » (Insert Name) Running Down the Wing…. (Insert Name) Running Down the Wing…. It has always been said that attack is the best form of defence and for many teams this is exactly how many of the Premier League’s top full-backs play week in, week out. Many goals have been created out of nothing thanks to link up play between the full-back and winger. Of course the full-back’s primary role is to defend and in order to get a better view of what the average full-back does for the 90 minutes when on the pitch, we looked at all full-backs in the Premier League during last season. In order to see their defensive abilities, we focused our attention on how many defensive actions they do per game, on average, as well as how they react when in medium and high risk situations. We also looked at the specifics like how they dealt with aerial threats and what they did when they were under pressure when in possession of the ball. Of course we looked at the fouls committed by these kinds of players too. When it came to their attacking play, we looked at the number of actions that they were involved in when it came to building an attack. This, in turn, led to us seeing how many chances they created per game as well as the number of times that they crossed the ball into the danger area and how many shots they took. Once we had all this information, we were able to create a special infographic that showcased our findings. This infographic can be found at the bottom of this post. It goes without saying that just because one particular player excels in defensive aerial duels, does not mean that they are good at dealing with high risk situations so it is impossible to pinpoint one particular player as the best or even the ‘average’ full-back but hopefully our infographic will give you an insight into the world of the full-back. « Group A Under the Microscope: Will the Indomitable Lions be Doing the Samba in Brazil?